A few months ago i was creating a worldclock with a night and day display where i needed a conical gradient. So if you would like to achieve these results without the conical gradient paint you have to rotate a line a change the color at every angle. This works out but if it comes to large angles you have to decrease the stepsize which leads to artifacts around the rotation center. So the conical gradient paint is especialy useful when you work with rotationally symetrical stuff. With this kind of gradient you could get more realistic results of circular structures like the two buttons in the image above. On the left side i used a conical gradient and on the right side i used a linear gradient. For most of the stuff the linear approach will work but the conical gradient gives you a more realistic shading. Things like the stainless steel button is hard to be generated without a gradient like this. The syntax is similar to the LinearGradientPaint and RadialGradientPaint where you define a float array that holds all the fractions of the gradient, a color array that holds all the colors for each fraction and a point that defines the rotation center of the gradient. Additional to that standard parameters i added a indicator for the usage of degrees and a rotation offset. As you can see it’s not magic but simple stupid java code and with a little variation in colors and fractions you could achieve effects like the stainless steel button. 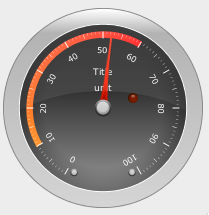 In my free time i’m working on a new component library (mostly gauges) where i also could use the conical gradient paint. In the screenshot you could see that the gauge has a area from 10 to 60 where it has a gradient in the background. 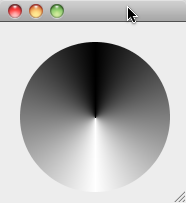 This gradient is also filled by the ConicalGradientPaint. 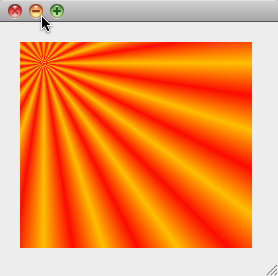 Here is the source as zipped Netbeans project. 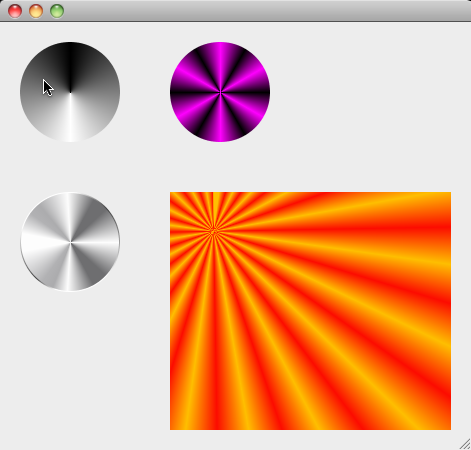 It contains the ConicalGradient class and a little demo that will give you an idea of how to use the paint.